[New for 2016] Hello all. I just wanted you to know it took me way too long to pick which review to post today, but in the end, fate decided. You see, this is our 1500th review but I'll get more in to that on Sunday (anniversary time!). Ahhhh, nevermind, this story is boring, let's get to the review! Ok, I'm a little scared. 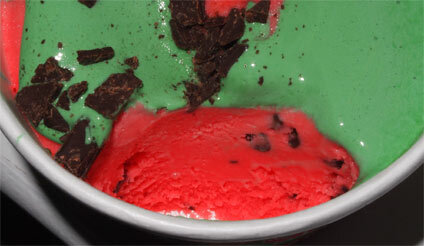 Well, it tastes like watermelon sherbet alright.... don't think I've had chocolate chips in sherbet before either. They are itty bitty chalky chips and while they spice up the texture, not sure I love their presence.... but I'm not sure. To half my brain, this doesn't make sense, but to the other half, it's just dumb summer fun. Will I ever buy this again? Unlikely. Will I tell you not to buy it? No. 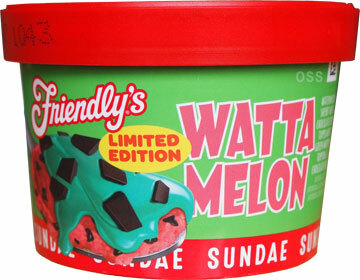 Only watermelon fans should be picking this up but I can't imagine they won't find it amusing. Never knock a product for doing it's job. 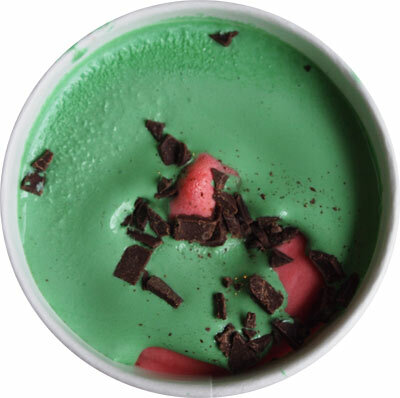 Baskin Robbins make much better watermelon sherbet. I like their candy "seeds"